We don't actually have fall weather here yet in Orange County which I'm pretty upset about, but I know in a few weeks it will be in the 70's and all will be right in the world. So for now I'm still in my summer clothes, but I wish I was wearing warm layers and cute scarves! Now that it's October I'm completely invested in the fall season and want to break out all my sweaters, boots, and dark lip colors. October is my second favorite month of the year (is it weird to have favorite months?? someone get back to me on this) because I get to spend my time watching some of my favorite Halloween themed movies, trading off between apple cider and hot chocolate, and cuddling up with a nice blanket on the couch. 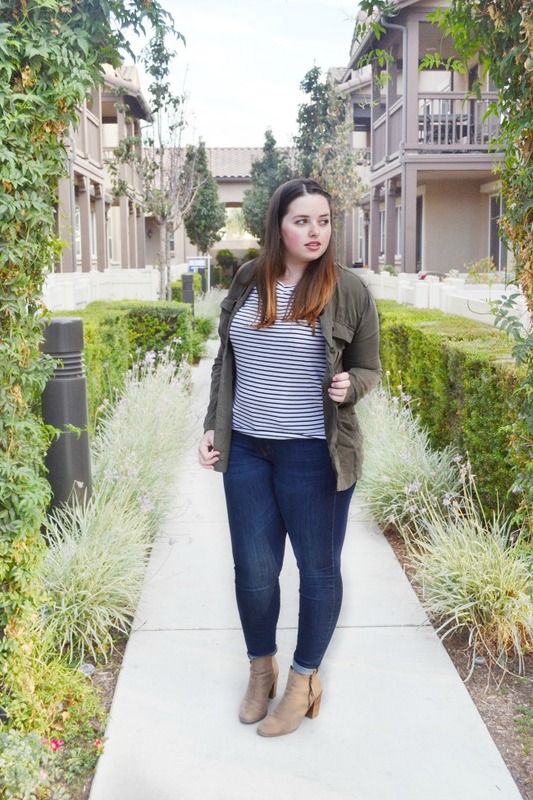 If you read my Fall Must Haves a few weeks ago, you may remember seeing this olive green cargo jacket. I loved it so much online that I went out and bought it the same day I posted about it! It does run a little small in the arms, but otherwise it's true to size and is incredibly soft. It also comes in a denim fabric if that's something you're interested in. 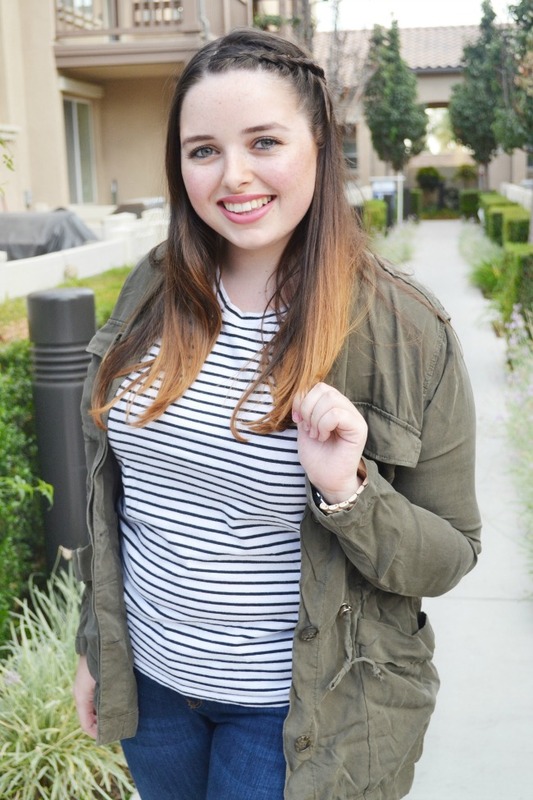 I think this jacket is something I've always pictured having in my fall wardrobe, but I never found a cargo/military jacket that I truly fell in love with until this one, and it's under $40! 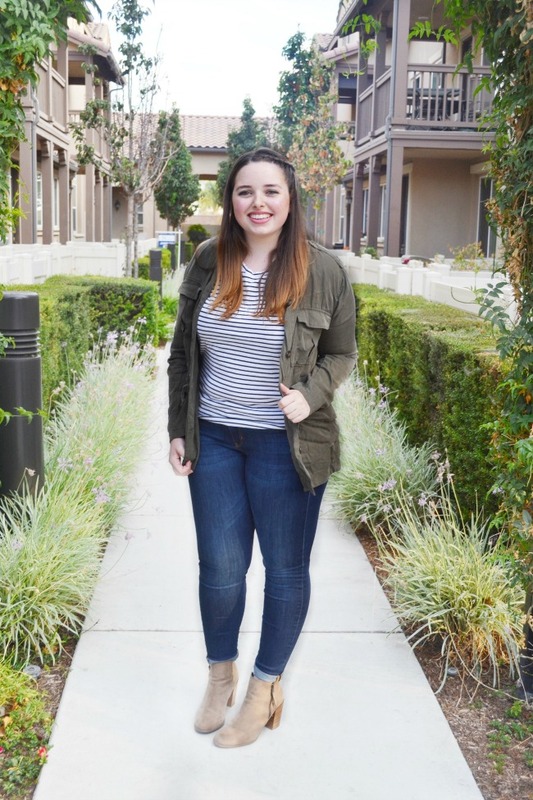 I wanted to make this an easy go-to outfit that I could throw on any day of the week, so I paired the jacket with a simple striped tee, jeans, and some faux suede booties. I'm almost at midterm season, (I have my first one tomorrow!) so I'm looking to bring as little stress to my life as possible, and that includes my wardrobe! I want to be able to quickly throw on a cute look that I can take from school to errands without fussing over something, so comfortable and casual is always the way to go! I think this is going to be my go to outfit for Fall with how simple it is to put together and mix and match different tanks and t-shirts to create multiple looks. 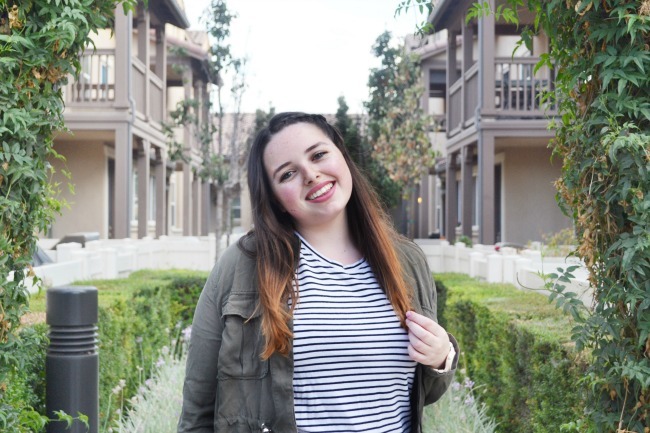 Love a cargo jacket and stripes! I actually don't have a jacket like this but need one! You're adorable! Halloween themed movie wise...I tend to go scary haha The Conjuring 2 was awesome! But if you haven't seen Zootopia yet, it is amazing and perfect for anytime of year! October is also one of my favorite months! Everything about this month is perfect in my opinion! I love your outfit! This exact outfit is one of my go-to fall outfits! I think its such a classic look! Happy Monday girly! That's definitely a classic fall look! I love your booties! You look super cute! I love the cargo jacket! Such a fun look for fall. I'm ready for it to cool down in Orange County but I think we still have a bit of a ways to go. Love this look!!! It is not Fall here as far is weather is concerned either. I am so ready for some cooler weather! You look so cute!! A cargo jackete is the perfect staple for fall! Also, side note your lashes are gorgeous! What a cute look! I love the booties and the jacket. That's a great jacket! 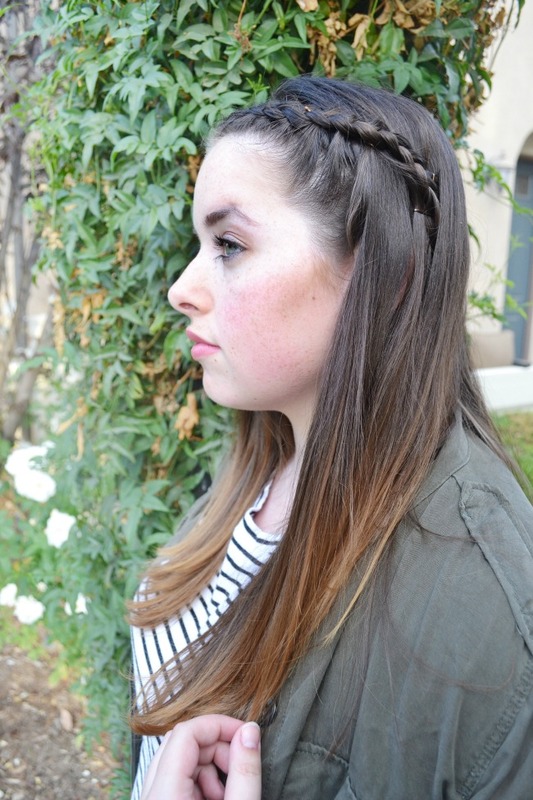 Love your braided hairstyle, too! Great outfit. The jacket is perfect! Love the braid in your hair too. I love the cargo and stripe combo! It's one of my favorites! So cute! These types of jackets are the best for fall. They go with everything! 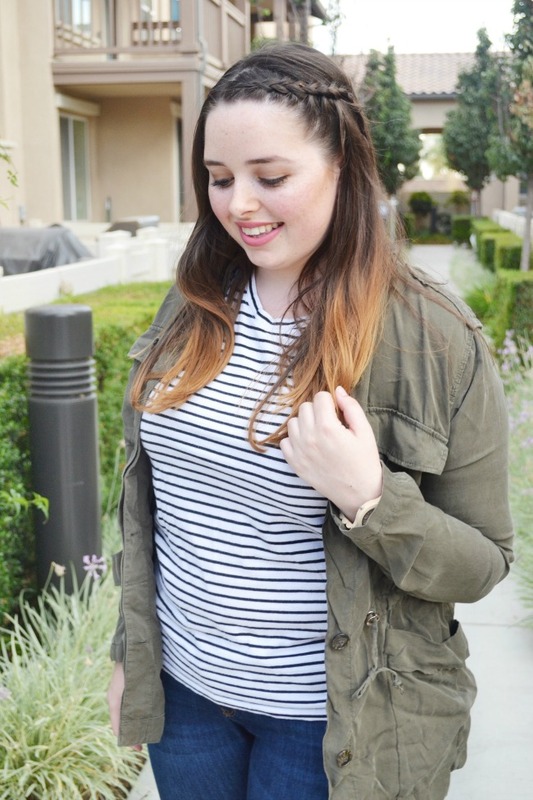 Loving this olive cargo jacket! So versatile for fall. Can't go wrong with H&M. The booties are really cute and such a bargain too! Love the braid...just so fun! This olive color compliments your skin so well (and it's perfect for fall, too)! Love it! Such a cute look! 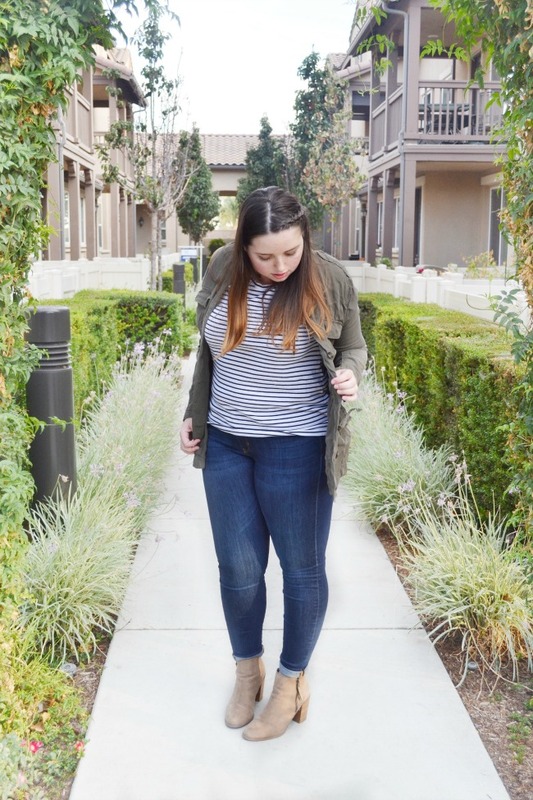 I love olive cargo jackets for fall! Such a cute fall look! I love this cargo jacket! I LOVE October, too! And your look has so many great fall basics - perfect for fall! This is such a cute look! I've been really wanting a jacket like that! This pairing is too perfect as the weather cools down. Rock it girl! Super cute!! I just got a similar jacket for the fall and am so excited to start wearing it! You look so pretty! I love you hair like that! I wore a sweatshirt, leggings and booties yesterday, and it felt like summer, so I definitely feel your pain. I'm ready for fall weather already! This is such a cute look! I love your hair! You have such a pretty smile! I loveeee your booties, they're exactly what I'm looking for right now.